The first words that come to mind when I see this Girl Diaper Cake are: Sugar and Spice and Everything Nice!! This diaper cake is LOADED with fun and essential baby girl items, and it must have made for an amazing baby shower centerpiece. This beautiful cake picture and recipe were artfully created and graciously submitted by Jennifer from Kathleen, GA. She has included her picture AND some detailed instructions including the time and cost involved in her diaper cake. Jennifer's girl diaper cake is an inspiration to us all and a wonderful example of how readers of this website are "paying it forward" to others who need some cute diaper cake ideas. THANK YOU JENNIFER!!! I just love the idea of a centerpiece being reusable. 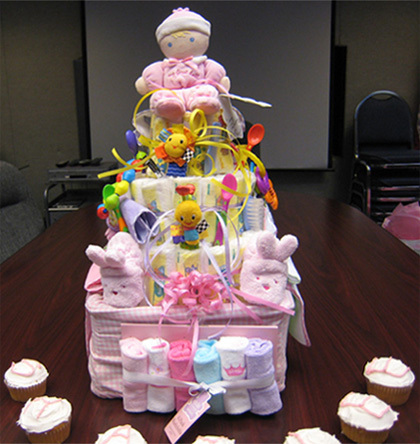 This diaper cake was made for a baby-shower thrown at work. It was a hit! Someone at the shower was giving the mother-to-be a shower the next day & used it as her centerpiece! Thanks Jennifer!! I wish I could have seen the look on the guests' faces when they saw this cake!